“RAMMELLZEE: Racing for Thunder” at Red Bulls Arts New York opens with sketches for the artist’s graffiti pieces. The drawings immediately bring to mind images of subway cars from the late 70s covered with graffiti. And some visitors may as well recall their own sketch books from the 70s and 80s filled with tags and letter designs for possible pieces to be realized on the street. 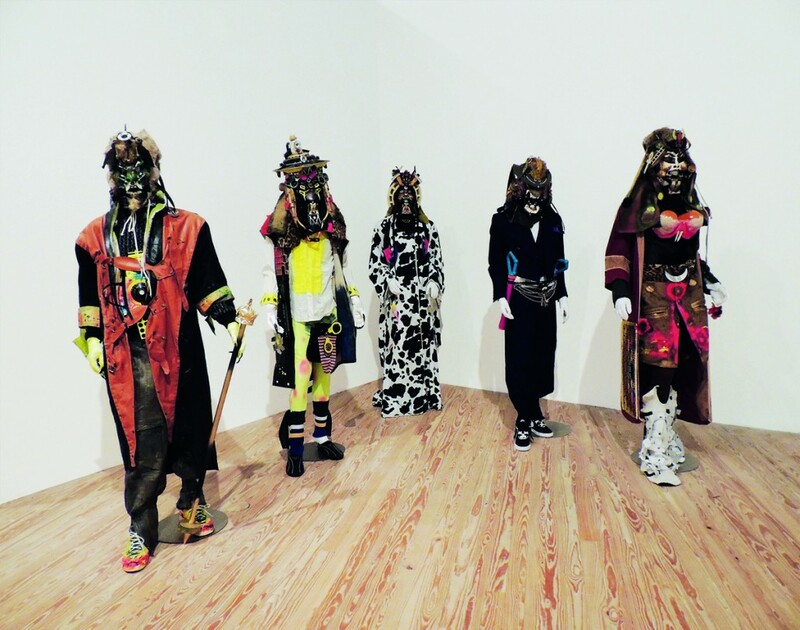 These early works are the strongest 2D work by Rammellzee that are included in the two-floor exhibition. As one continues through a dark tunnel lined with early 2D works and iPad slideshows accompanied by audio recordings by celebrities, one will enter a screening room. Projected across bleachers are an assortment of video sequences capturing the artist rapping, lecturing, performing. One video capturing Rammellzee rapping from his Beat Bop classic at a club includes drawings, text and animation by Jean-Michel Basquiat superimposed over the performer. You can see the video here Rammellzee, Toxic C1 and Basquiat Live at the Rhythm Lounge 1983. There is also a sequence from Charlie Ahearn’s 1982 “Wild Style” featuring Rammallzee performing on stage. Perhaps amongst the most entertaining sequences are Rammallzee performing as a Garbage God in outlandish costume to Northern European gallery goers who complain to watch his back as he makes his way through the small crowded gallery. Also entertaining (for short bits) are his lectures to perhaps student audiences to his exhibitions, also costumed as a Garbage God and at one point shooting fire from his mouth (which was awesome to watch and hear the gasps from the live witnesses). Proceeding beyond the screening room, one enters a large gallery with primarily 2D pieces. These works are spray painted works, epoxy frescos, assemblage wall pieces combining found objects, spray paint splashes and loads of resin. Some works feature space ships flying through spay paint environments. For the most part these works seem uninspired and more like 80s bad art. In considering this exhibition, I came upon this excellent NY Times 2012 article on Rammellzee that is worth a read, if interested in his work and life. 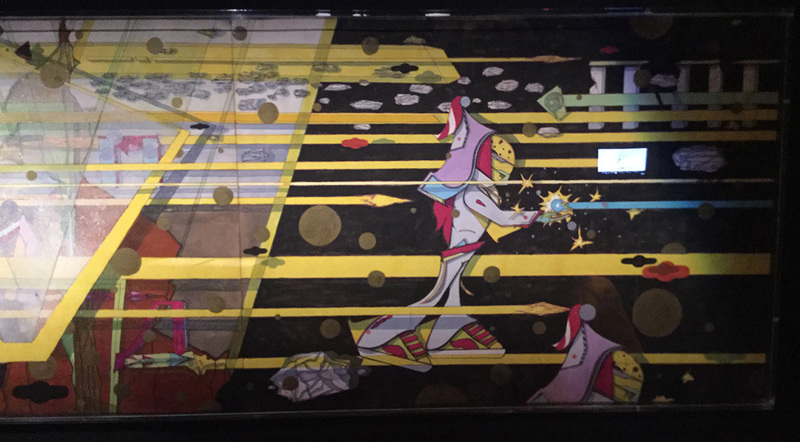 However, if you have a free couple of hours, “RAMMELLZEE: Racing for Thunder” exhibition is a great way to intimately learn about the artist directly through his voice from hours of archival material. Amongst the 2D paintings on the top floor, there is a small listening booth with extended interviews with the artist discussing his life and philosophy. There are also videos with Rammellzee working in the studio, discussing his ridiculously toxic practice as you watch him pouring gallons of resin and spray painting indoors without a mask. Red Bull Arts has done an amazing job of creating a rich portrait of the artist.